As I mention on the photo blog, I went over to an old stamping ground of mine today: Glebe and Forest Lodge. One reason was to drop off copies of The South Sydney Herald at the bookshops whose proprietors I had interviewed (on Skype!) for my article in the July edition. Cornstalk Books was one of my destinations. The room above the shop – empty then – was the place all but the last issues of Neos were launched between 1981 and 1984. Memories! In the $5 tray outside I picked up something of a treasure: A D Fraser (ed), This Century of Ours: Being an Account of the Origin and History during One Hundred Years of the House of Dangar, Gedye & Malloch Ltd, of Sydney, 1938. I am sure Jim Belshaw would be interested. (I’ll sell it to you for $100, Jim! ;)) I see it is $25 on that catalogue at the link. 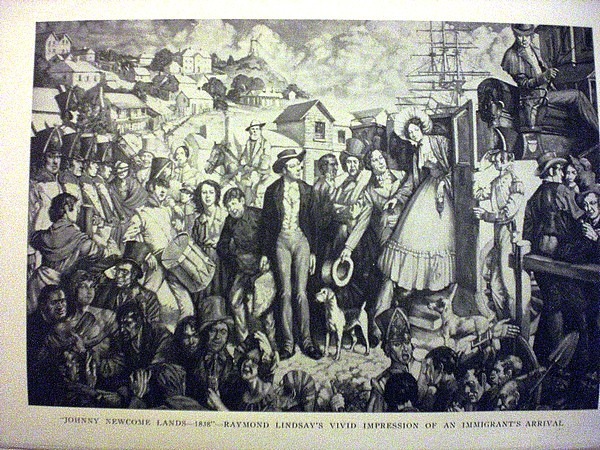 This is the frontispiece by artist Raymond Lindsay.